The Michelin Guide recognizes the best restaurants and hotels in cities in 28 countries, giving top restaurants a rating of one to three stars. 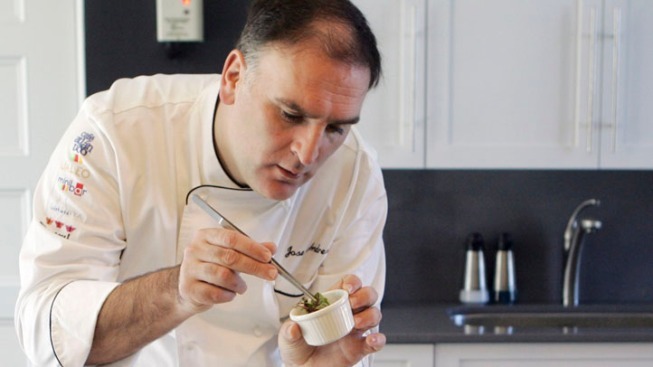 Jose Andres is one of the lucky D.C. area chefs to have a restaurant honored in the district's first Michelin Guide. Three D.C. restaurants received two-star ratings in the District's first-ever Michelin Guide, released Thursday. The Michelin Guide recognizes the best restaurants and hotels in cities in 28 countries, giving top restaurants a rating of one to three stars. Jose Andres' Minibar (855 E St. NW), Aaron Silverman's Pineapples & Pearls (715 8th St. SE), and Patrick O'Connor's The Inn at Little Washington in Virginia were each awarded two stars. The chefs and restaurant owners took to Twitter Thursday to celebrate the honor. Surprised and elated by the news today. Congratulations to all of the restaurants recognized by #MichelinDC! Michelin's International Director Michael Ellis said in a press release Thursday that Washington's culinary offerings have significantly developed over the past five years. These changes to D.C.'s restaurant scene "have made its local cuisine among the most dynamic in the world," the release reads. After Bon Appetit named D.C. its Restaurant City of the Year in August, receiving a Michelin Guide is the latest testament to what the city's culinary scene has to offer. "We've been looking at the D.C. area for quite a while now, and we noticed a real evolution, a real dynamic, going on in the cooking scene," Ellis told News4's Eun Yang on Wednesday. "We thought the timing was good, so we started last year, and we came up with what we think is a very good selection." Nine other restaurants received one star: Aaron Silverman's Rose's Luxury, Jeremiah Langhorne's The Dabney, The Blue Duck Tavern, Kinship, Plume, Tail Up Goat, Masseria, Fiola and Sushi Taro. Almost 80 percent of restaurants that appear in the guide did not receive a star rating, but that doesn’t mean they aren't great, Ellis said Wednesday. "Just the fact that a restaurant is in the Michelin Guide is already a sign of very good food," he said. Anonymous inspectors rate restaurants on quality of ingredients, mastery of cooking technique, harmony and balance of flavors, regularity over time and throughout the menu and value for your money, Ellis said. The inspectors always pay their bills to ensure their independence, he added. Michelin also named 19 District restaurants to its Bib Gourmand list of high-quality but affordable options earlier this month. The full 2017 Washington Guide is available on the Michelin Restaurants U.S. app and in bookstores for $12.95.